HTC today announced consumer availability of Vive Tracker, the tracking module that uses Valve’s Lighthouse tracking standard. The company also announced North American pre-order availability of a number of Vive Tracker accessory bundles that are slated to make their way to consumers in mid-December. First shipped to developers earlier this year, HTC is now selling the Tracker to consumers with the full confidence that anyone can pick it up and use it. 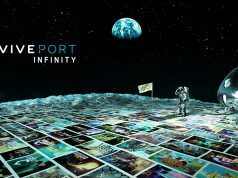 That’s right, it’s not a new version, but it does now at least claim official support for dozens of VR titles and multiple accessories including what HTC today revealed to be Hyperkin’s Hyper Blaster gun, a Racket Sports Set, and a strap system from Rebuff Reality for basic body tracking. The first Vive Tracker accessory bundles launch today for pre-order via multiple retailers with expected arrival dates of mid-December. The company says it will have more information on international availability later, as for now, the accessory bundles are North America-only. The Vive Tracker itself will be available for pre-order through the official Vive store and its partners for $100. Hyperkin’s Hyper Blaster, clearly paying homage to the NES Zapper, was first spotted with a Vive Tracker screwed on top back at E3 this summer. 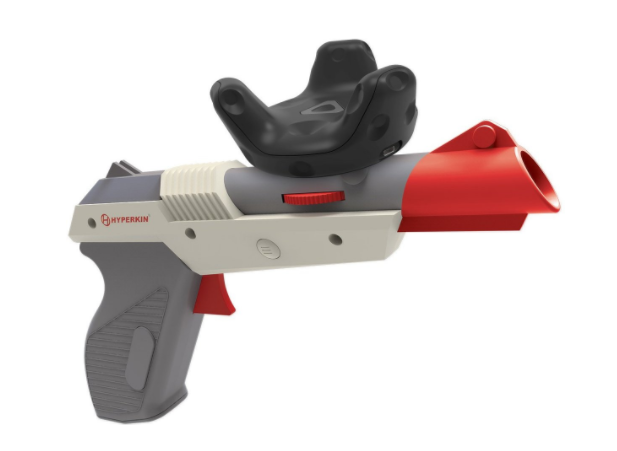 HTC says when paired with the Tracker, the Hyper Blaster serves as both a gun and motion controller in integrated games including Duck Season, Arizona Sunshine, The American Dream VR, Operation Warcade, TacticalAR, and Practisim VR. Sold exclusively through Amazon, the Vive Tracker + Hyper Blaster bundle includes a copy of Duck Season and will set you back $150. Unique to Duck Season, the Blaster is virtually represented within the game world. In addition to the titles already listed, HTC says they’re working with 10 additional developers to integrate the Blaster by Q1 2018. 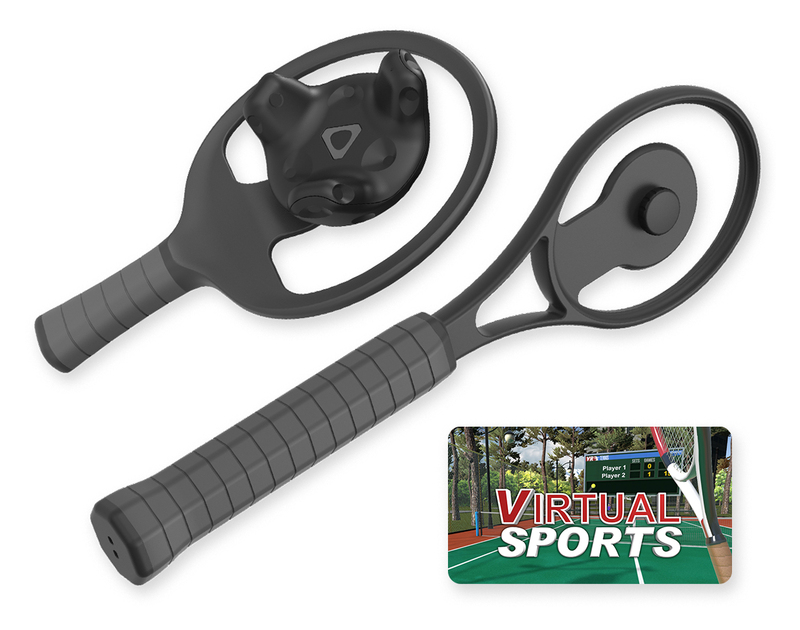 Leaked a few days ago on the US-facing HTC Vive site, the Racket Sports Set is targeting the Ping Pong and Tennis-lovers out there with a pair of custom-molded and weighted accessories that supposedly feel like real paddles and rackets. 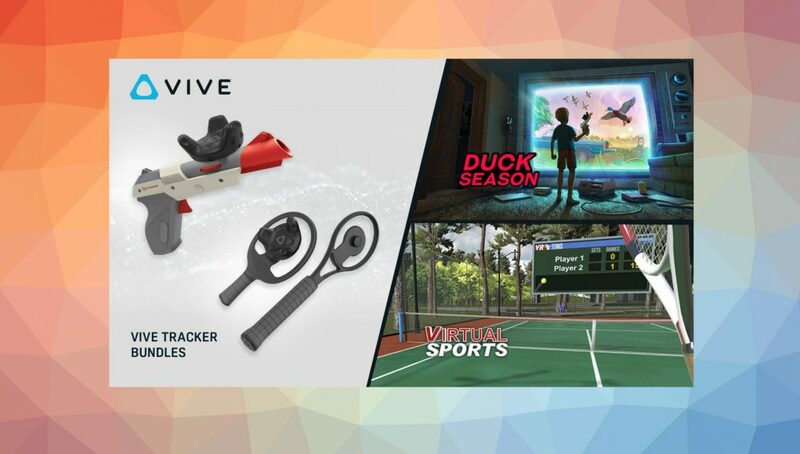 The bundle, which includes both Ping Pong and Tennis handles, a Vive Tracker and a redemption code for Virtual Sports from Vive Studios, will sell for $150. Pre-orders are available today via HTC’s site, Amazon, Abt Electronics, BH Photo, Fry’s, Gamestop, Micro Center and NewEgg, with additional retailers expected in the coming months. A Racket Sports Set is also available without a Tracker for $80 in case you already own one. HTC says an additional six titles supporting the Racket Sport Set will arrive by end of year. One of the most simple use-cases that arguably has one of the biggest impacts on immersion is body tracking, and with the help of a the Rebuff Reality TrackStraps the Tracker can put your feet, wrist, hip or leg movement into VR experiences—if the game supports it, that is. A pair of TrackStraps is available now for $25 on Rebuff Reality’s site and includes a redemption code for Redfoot Bluefoot Dancing on Steam, a game inspired by Dance Dance Revolution (DDR) and Audioshield. 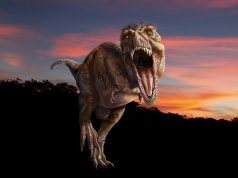 Games including Island 359, Climbey, Holodance, Goalie VR and High Fidelity either already support Tracker, or will in the coming weeks before launch. See the full list of compatible games here. HTC is highlighting these three bundles specifically, but you can bet there are many more accessories to come from other manufacturers in the coming months. That said, it’s safe to say if a game doesn’t make mention of support for the Tracker or a specific accessory, you won’t be able to use it. 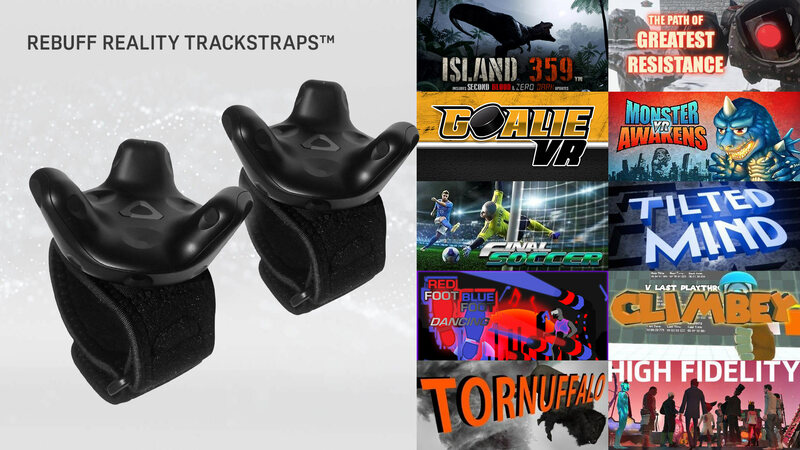 We’ll be bringing you more news on Vive Tracker accessories in the coming months. That racket looks extremely dangerous!! Only people with very large play spaces should even attempt to use those. But if you have the space they look very fun!. Yeah I would stop with the ping pong racket size I hit things bad enough the size the controller is by itself. It’s barely longer than the ping pong paddle. I think I’ll have to get it, it just doesn’t feel right playing ping pong or tennis with a vive wand. Thinking the same thing. I have a fairly large play area, but extending my arm (roughly 3′) with another 12″-18″ extension would put things on bookshelves and my flat-panel in jeopardy. Thinking about this a bit more, the though occurs to me: maybe I should consider going out and playing actual tennis or actual ping pong? Crazy, I know. Are the trackers compatible with lighthouse v2? I thought that they were compatible with Lighthouse v2. That the opposite is the case, that new tracking devices (potential future controllers or more importantly HMDs) will come out which are incompatible with v1. I though Duck Season’s main weapon was a shotgun? That looks really cool though. The exciting thing about this is how early we are. Overpriced plastic crap, there is no added value. Besides that a dev needs a 100% accurate model in their game to support it , else the entire shape does not matter. eventually just end up with 1 game for an over 100 usd gadget. or maybe we all like to play 10 different versions of tennis and 25 shooter games with all just one and the same gun. This concept just works when it comes with a game, and there for too expensive. Leds don’t cost even a dollar cent , the entire tracking pod cost just a few dollar to produce. HTC going the wrong way now…. From the photos I can see that VIVE tracker has 12 sensors(so 12 sensor IC, and 12 photodiodes), but I might be wrong. Also it looks as for now they are using old type of sensor modules, which are a bit more expensive. 50$ Is acceptable for this tech, but I think they easly could go to 25$. 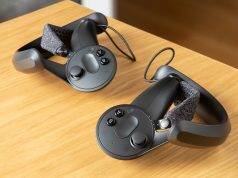 Why do these cost more than a single VIVE controller? If you bought both of these it would set you back as much as a TPCast. If HTC wants to grow this market they should be selling these at a loss and trying to get the market to adapt them as fast as possible. This price-point seems to indicate it’s just a speciality item they intend to gouge early adopters out of their hard earned cash. Even if they included both for 150 it’s still too much. You should be able to buy just the sensors alone for under 50 each at this point; that would be a reasonable price. This is priced like it’s a force-feedback steering wheel or other high-end user controls. I thought the developer price of 150 per sensor was a temporary thing; I’ve been waiting for the price to drop on this thing for a while now. Silly overpriced. Given the choice of buying these or a TPCast it’s no contest, loving the wireless free VR experience big time.